You can invite any other person to join your team and there are no limitations on how many team members you can have. All you need to do is enter their email address and we will send out an email invitation for you. If you have different groups of people to manage then you can also set up multiple teams at no extra cost. In this article, we are going to walk you through the process of setting up your own team and managing survey access for your team members. 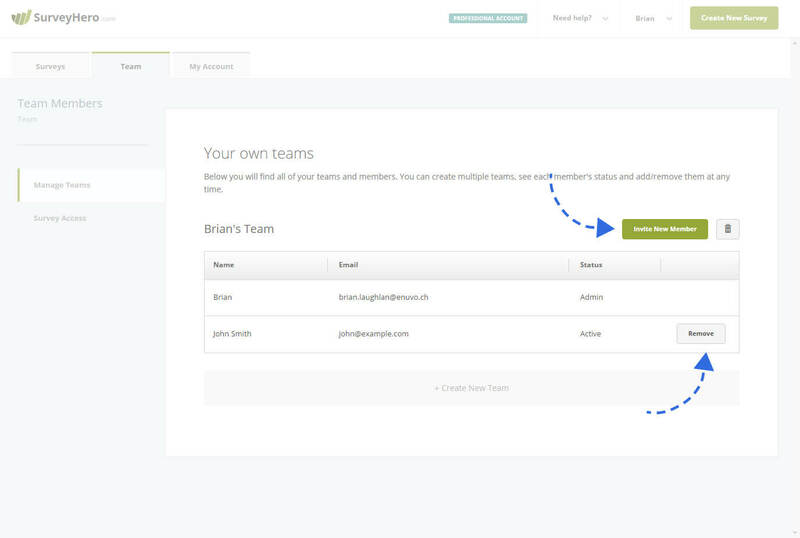 To set up your team you will need to go to the “Manage Teams” page by clicking on the “Team” tab located in the main menu of the account area. 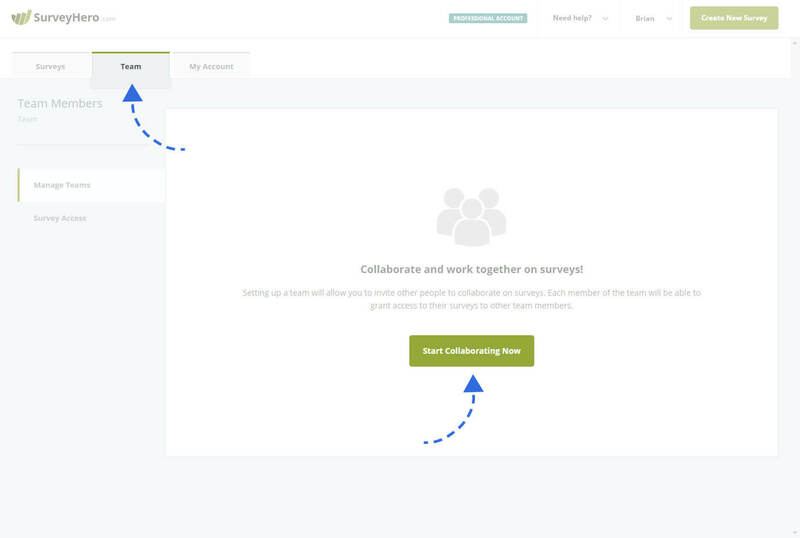 To create your first team, click on the “Start Collaborating Now” button which will open an overlay. You will see that your team name has been prefilled. You can change this to anything you like. The name you use here will also be used in the email invitations we send out for you. 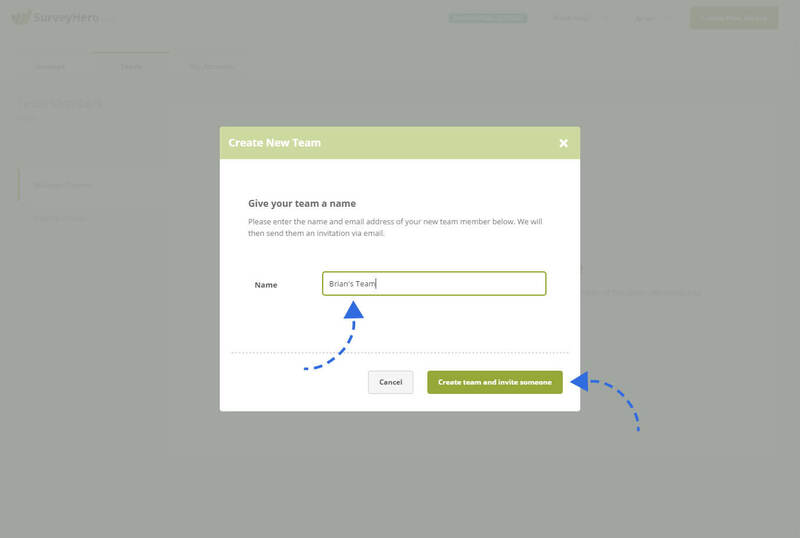 The next screen will allow you to invite a new team member to your team. Fill out the name and email address of the person you would like to invite and click “Send Email Invitation”. 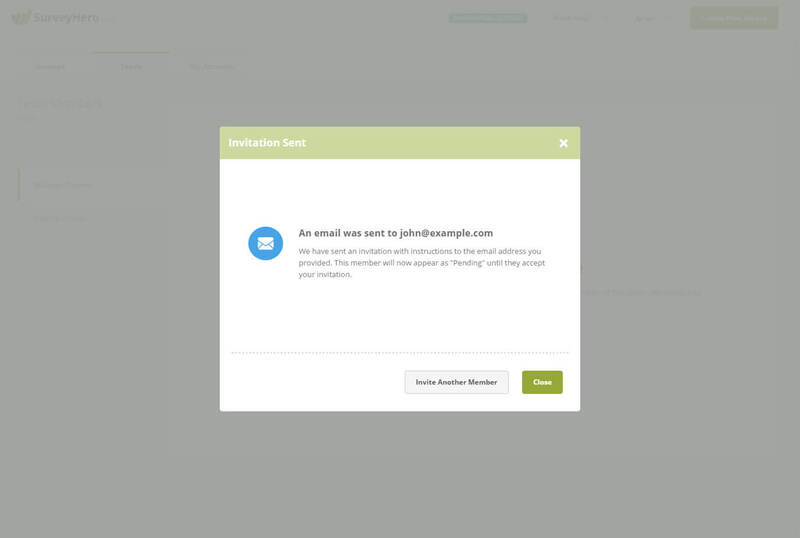 We will automatically send an email invitation to that email address with a unique invitation link. When the person you invited clicks on the invitation link they will be taken to a screen that will ask them which account they would like to use. If the user is not logged in they will have 2 choices. 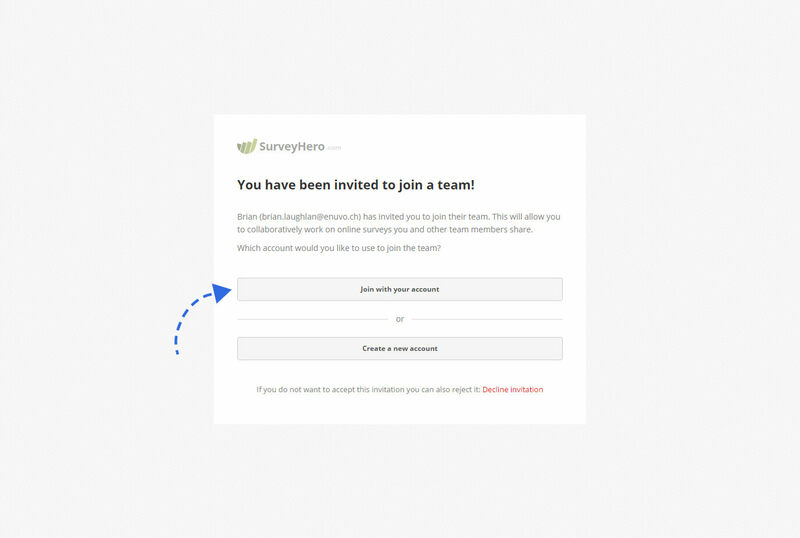 “Join with your account” will take them to the login screen where they can log in with their existing SurveyHero account. If they do not have an account yet they can click on the “Create new account” button which will then lead them to the signup page. 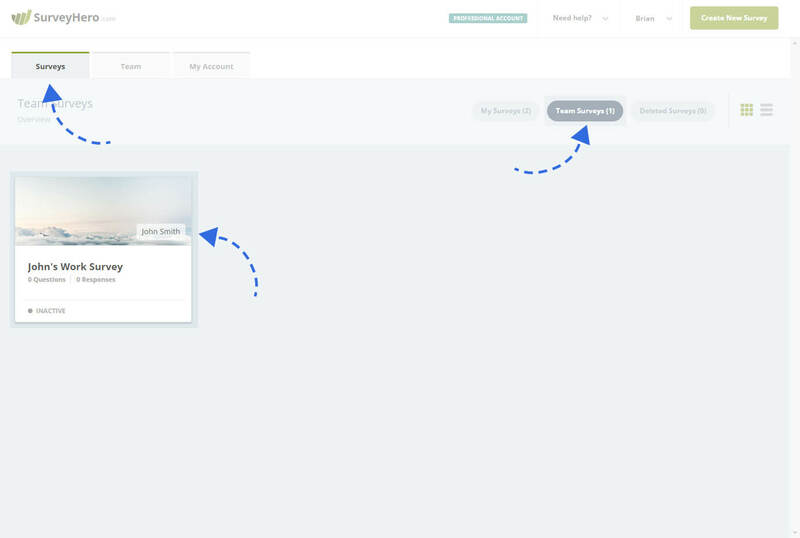 If the invited person is already logged in when they view this screen, then they will see an extra button that will allow them to simply use the account they are currently logged in with. The user can of course choose to decline the invitation if they want. We will notify you by email as soon as the invitation has been accepted or declined. Once you have a team set up, it will be showing all its members. Each member will appear as a row in the table and you will be able to see their status. If the user has a “Pending” status, this means that they have not yet accepted or declined your invitation. If they decline your invitation, their status will be changed to “Declined” and if they accept it will be “Active”. A member needs to be “Active” in order to being able to share access to surveys with them. You can both create and be in multiple teams. This is useful if you have different groups of people to manage. For example, you could have a team with work colleagues and another team with fellow students. 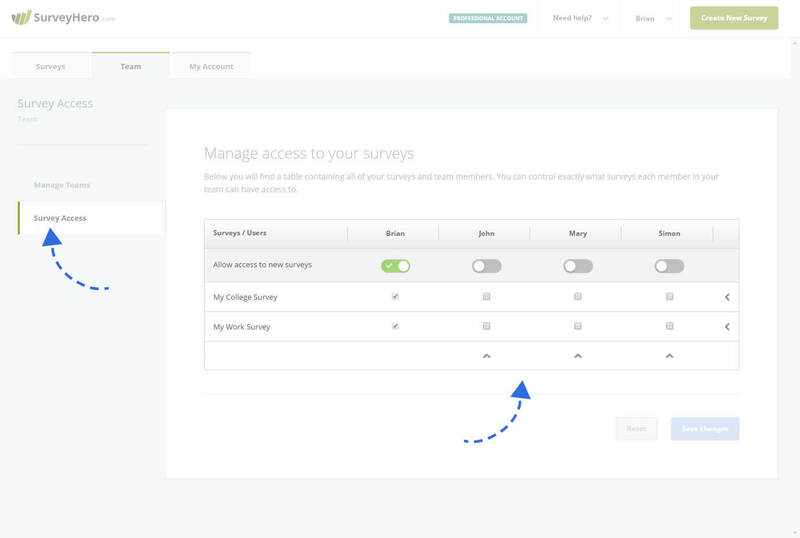 Since work colleagues do not need to see the surveys from the fellow students, separate teams are a great way to organize and maintain your surveys. If you are a member of any other teams then these teams will also appear on the Manage Teams page below your teams. In those tables, you will be able to see the other team members as well as an option to leave the team. You can leave any team you are in whenever you choose. Removing a member or deleting a team will not delete any accounts. It will only dissolve the team. 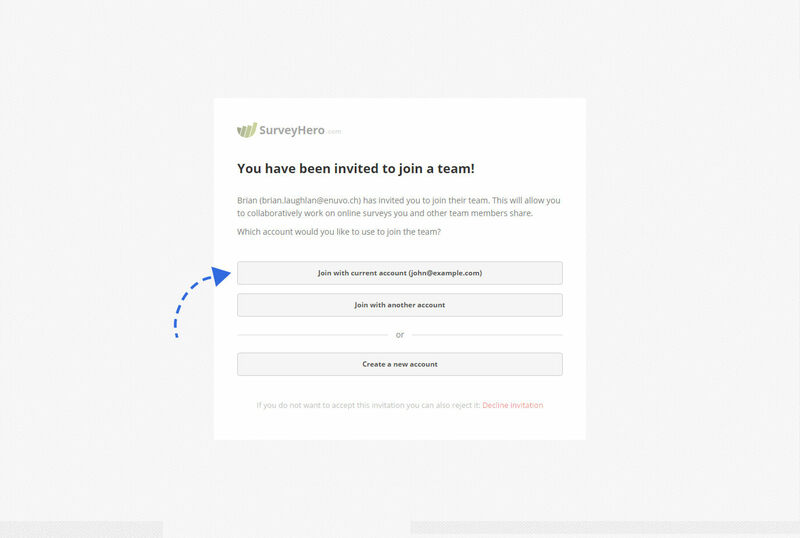 On the Survey Access page, you will find a table containing all of your surveys and all available team members across all teams you are member of. 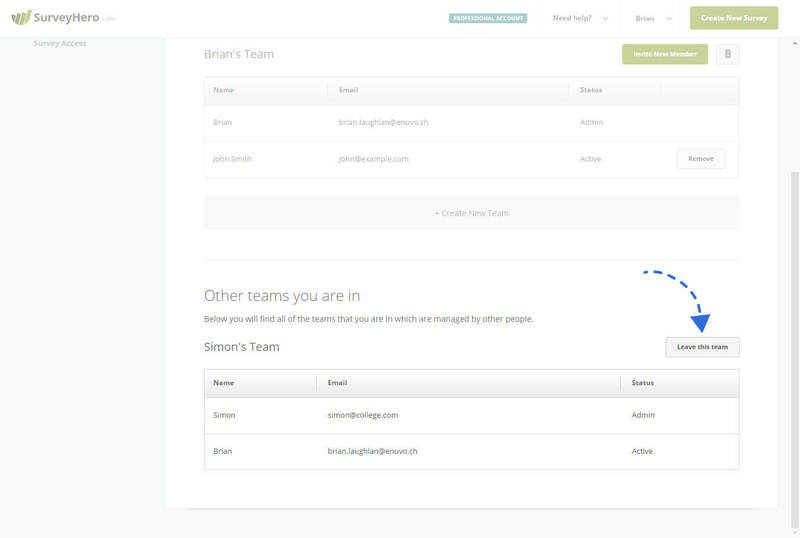 You can control exactly what surveys each member in your team can have access to. The survey access table makes it very easy to define granular access to surveys by simply checking the boxes. 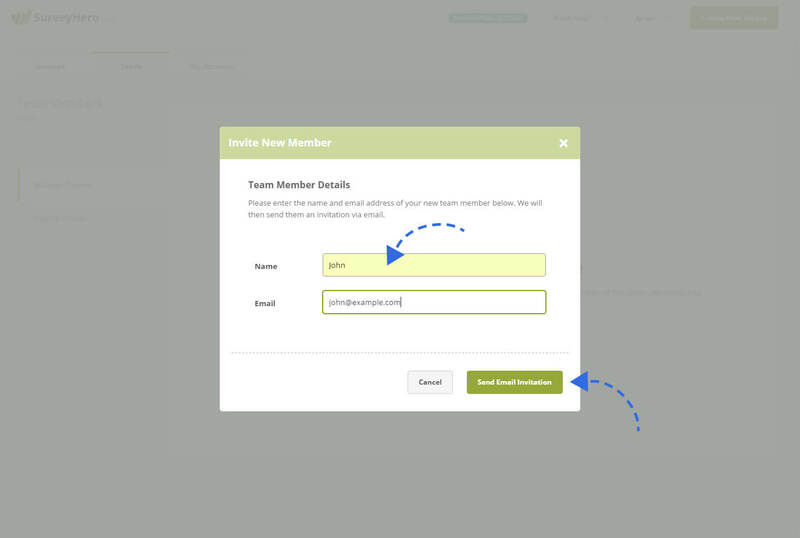 You can also revoke access to a survey by un-checking the box in the relevant team member column. By default, when a new team member is added and active, they will not have any access to any of your surveys. You will need to set this up first. You can choose which of your current surveys you would like to share with them. 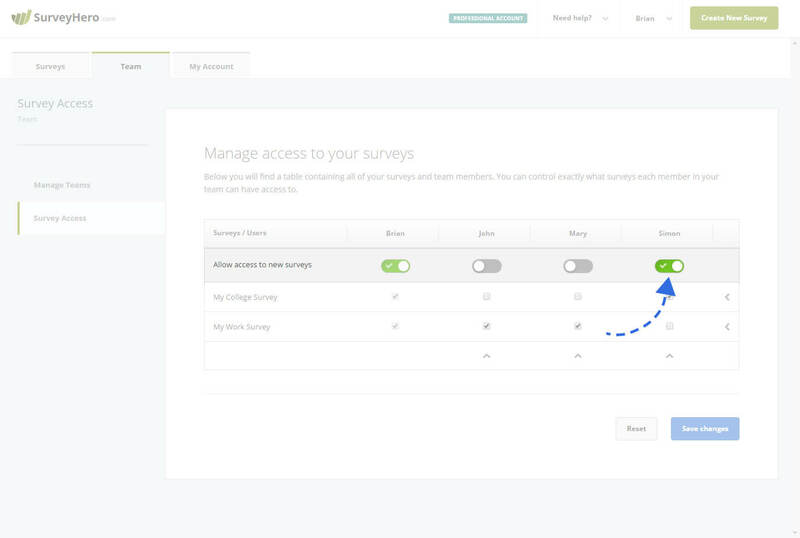 You can also set the option that any future survey you create will automatically be made accessible to another member too. To do this you can simply toggle the option in the first row of the survey access table (“Grant access to new surveys”). You can view team surveys which you have access to in the Team Surveys page which can be found in the Surveys section of your account area. You will be able to edit and view results of these surveys just as if they were your own. It is, however, not possible to delete a shared survey, unless you are the owner of it. Team collaboration makes everything more secure since every member will have their own log in credentials, avoiding the security risk of having to pass around username and password between different people. Whether a survey can use premium features depends only on the owner (account) of the survey. 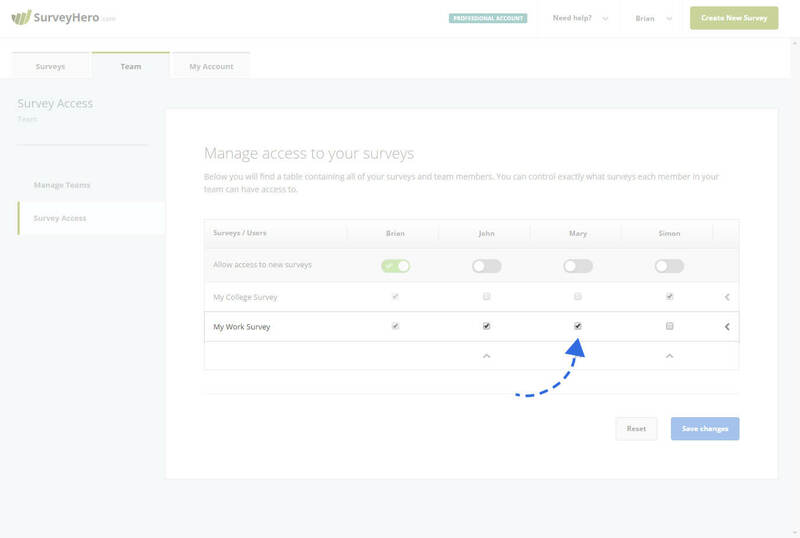 If the account that created the survey is using a paid plan, then the survey will have access to premium features – regardless of who is accessing the survey. Therefore, if a paying user grants access to one of their survey, the team members will be able to use the premium features – for that survey – too. Team members do therefore not necessarily need to be on the same plan. However, when a free user grants access to one of their survey, the team members will not be able to use premium features, even if they are on a paid plan. When collaborating on a survey, it is only relevant whether the owner of the survey is using a premium plan. Collaborators will then also have access to premium features for that survey, regardless of whether they are paying users or not.